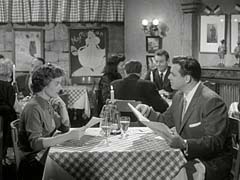 Della and Perry make an attempt at dinner in a romantic French restaurant only to be interrupted by business as usual. Perry gets a phone call and an envelope containing $500 from a mysterious woman. She wants him to make an exchange for her: the money for some documents. It�s amazing enough that a lawyer would put himself on the line for a woman he�s never met; but it�s incredible that he�s still willing to represent her after the drop-off point turns out to be the scene of a murder. The mystery woman, Marian Fargo, is played by a young and dark-haired Angie Dickinson. Charles Gallagher is played by Paul Picerni�fifties �jock� and war-movie hero. CARS: 1957 Mercury Monterey Convertible, 2-tone: medium color & white, white top up (described as �beige & brown�), 1957 Ford Skyliner retractable, black, top up, 1957 Ford Thunderbird, black, w/ hardtop (Drake), 1957 Ford 2dr sedan, light color. From The Cars by Greg Cockerill. Perry and Della dine at the classy Ferrolds Cafe. Perry complains about the $1 price of coffee. Across the room is a picture of a woman in a white dress. It�s an 1895 poster of May Milton by Toulouse-Lautrec. No wonder Mr. Ferrold charges so much! Learn more at the Indianapolis Museum of Art. Submitted by Leah, 7/12/02. 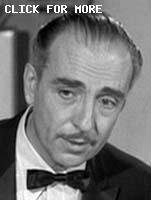 Vincent G. Perry, who had a very abbreviated acting career, makes his only Perry appearance here as the Judge. I had to look twice to be sure he was not a different judge, the judge in �TCOT Final Fade-Out,� Erle Stanley Gardner. His appearance is quite similar. Submitted by PaulDrake 33, 4 December 2009. For much of this episode (at least 3 days) it is raining. Many of the main actors are wearing raincoats. Yet in spite of the rain, on two consective days when Perry drives his car to make visits, he gets out of his automobile, goes into the house, and leaves the driver's side window rolled down in the rain. Submitted by PaulDrake 33, 21 February 2013. + He did leave it rolled down in the scene where he arrived with Drake, but it wasn't raining; he mentioned that it had been raining "until an hour ago." Submitted by francis, 5/24/13. Not one, but two applications of the "Pitkin Principle" (mentioned in my comments for Episode 18, TCOT Cautious Coquette) in this episode. ESG's Medford Carlin becomes Samuel Carlin, ESG's Arthman Fargo becomes Arthur Fargo. Submitted by BobH, 9 January 2016. In the opening scene, bus passenger #2 (the woman with the black hat carrying the polka dot handbag) is the same actress (Jeanette Nolan) who played Mrs. Kirby in the previous episode, #22, TCOT Fugitive Nurse. Submitted by Kim, 7/5/10. Pictures here. + That's not Jeanette Nolan, who certainly didn't need to hire out as an extra at this point in her career. Submitted by francis, 5/24/13. The newspaper held by the eavesdropping private detective in the first scene has a screaming headline �PROMINENT ATTORNEY ....� (the rest of the headline is obscured). This newspaper is from an earlier episode in the first season when Perry is charged with perjury. Submitted by Kim, 7/5/10. Pictures here. Speaking of LA Chronicles: At about 25:35 on the 2006 Region 1 Paramount DVD is a newspaper with the screaming headline WIFE INDICTED FOR HUSBAND'S MURDER, subhead "Marian Fargo Accused of Shooting Husband", and a photo of Marian Fargo. But there's no associated news article. (26-year-old Angie? Yep, that's all I need.) Submitted by (lowercase, with a comma and period) masonite, 07/22/13. Uncredited Actors: This is another two-fer episode for Don Anderson. As the scene at Ferrold�s Restaurant begins he is talking to headwaiter Pierre (played by Jan Arvan) as Marian Fargo (Angie Dickinson) watches Mason and Della arrive. Later in the episode, after the explosion at Carlin�s home, he plays a uniformed policeman who stands in the driveway where Mason and Paul are watching the action. Submitted by FredK, 30 September 2010. + Actually, we see Anderson at the restaurant when Marian herself arrives. Submitted by 65tosspowertrap, 4-6-2014. Location: About 27 minutes in there is a quick exterior shot of Parker Center at 105 N. Los Angeles Street. Submitted by Eric Cooper, 10 January 11. 150 N Los Angeles St.
Sightings: A busboy at Ferrold�s is none other than the Pencil Mustache Man, all bedecked in white. Distinguished Gentleman #1 plays a witness at the fire scene and the court reporter. A courtroom spectator. is Distinguished Gentleman #2. More here. Submitted by gracenote, 8/30/2011. +We see Distinguished Lady #4 in the opening scene at the bus station and later in court behind Perry. We also see the Pencil Mustache Man at the bus station after the murder. Submitted by BigBill767, Nov 11, 2016. Syndication cuts: Della gets call from Drake's operator who's trying to locate him; Drake at pay phone with date [see comment below] and Della telling him to meet Perry at Carlin's; Nora and Diana leave and their conversation; scene with Mason and Marian concerning Charles, blackmail and the gun that killed Carlin and her husband; scene with Charles at his apartment with Daniels. Additional Hallmark cuts: Perry and Della driving away from Carlin's house; part of Perry watching the Carlin house before the woman arrives; fire truck #3 arriving, the fire, the firefighters readying the hoses and Perry watching; scene with Drake and the waiter at Ferrolds; Drake tells Perry he can't locate Pierre; Perry calls Lt. Tragg; part of Della and Charles' conversation about Charles talking to Mason, an officer of the court who would have to turn him in; another conversation with Mason and Marian about truth, alibis and Charles. Submitted by Wiseguy70005, 7/17/12. After the explosion Perry tells Paul to call the fire department and Paul rushes off. Right before the scene segues to the next one we see Paul returning. Did he have to borrow a nickel from Perry to make the call? Did he spend all his loose change on his abandoned date? Or maybe Paul made the call from his cell phone enabling him to return quickly. Submitted by Wiseguy70005, 11/18/13. After the fire trucks arrive we see Perry talking with the neighbors, followed immediately by a close-up of him watching the fire and then segues back to him talking with the neighbors as Paul returns. Submitted by Wiseguy70005, 11/18/13. After Perry sees the body through the window, he makes no attempt to hide his fingerprints when he opens the door although he later uses his handkerchief on the phone when he calls Tragg. Submitted by Wiseguy70005, 11/18/13. Paul tells the waiter he's not hungry. Is that a first for Paul? Submitted by Wiseguy70005, 11/18/13. + Speaking of Firsts, is this the 1st/Only time Della addresses Paul as "Mr. Drake" [over the phone scene]? Mike Bedard 5.3.16 MeTV airing. Mason tells Carlin that his client said he had to see him tonight. We seem to hear the entire phone conversation between Mason and Marian and she says no such thing. Submitted by Wiseguy70005, 11/18/13. Most characters pronounce Los Angeles with a soft-g sound. Diana Maynard consistently pronounces with a hard-g sound. In Burger's examinations of Diana Maynard he pronounces it both ways. Submitted by Wiseguy70005, 11/18/13. Incorrect show summary: Perry actually received two envelopes. One contained his $500 retainer; the other contained (presumably) $10,000 he was to give to Carlin (although it looked awfully thin to contain $10,000). Submitted by 65tosspowertrap, 4-6-2014. Continuity: When Perry and Della leave Carlin's house, the coat hanging next to the door is wet. When we see it again thirty seconds later, it is dry. Submitted by Alan Smithee, 4/7/14. It's for you, Mr. Mason: A baffled Perry has just sat down at Ferrolds Cafe when Pierre, the headwaiter, brings him a telephone and advises him that it's a "her" calling. Submitted by francis, 6/07/14. Burger's office (@ 40:04) appears to have been redecorated since "The Runaway Corpse" (@ 25:02). There is slightly different lettering on the door, his desk and chair are different, the coat/hat rack and large lamp in the corner have been changed, and the back door now has a "PRIVATE" sign on it. However, the back door itself appears to be the same door and Burger's desk lamp and ashtray may be the same although the lamp now looks a little darker. Submitted by Wiseguy70005, 6/21/14. They are now using the courtroom setup where the witness stand cannot be seen from the defense table and vice versa. The front of the witness box is inline with the judge's bench. In some episodes, you can see Perry sticking his out when they do a behind the witness shot toward the defense table. It looks like poor planning and should have been fixed immediately. Eventually, it is corrected with the witness box jutting out. Part of the problem is the space in front of the prosecutor/defense tables is tight in some shots. Submitted by Perry Baby 12/5/14. Sponsored Items: I watched this episode on MeTV and once again I saw the same FOUR sponsored items pictured at the end in episode 7 and 21 show up here. This time, I WAS ABLE to see that the FIRST one was actually "Sweetheart Soap", as helpfully provided by Wiseguy70005 on 4/14/15 for episode #7. The picture and lettering were VERY clear in this one...YAY! ;-> The Second was "New Blue Dutch Cleanser". The Third was "trend" (with a lower case, "T"). The Fourth was "Beads-O'-Bleach". Submitted by mesave31, 04/21/15. That $1.00 cup of coffee would ring in at $7.35 today. How much does a cup of coffee cost at some of those well-known coffee shops today? (I�m not a coffee drinker). Submitted by billp, 1/1/2009. + A tall (12 ounces, the smallest size) "freshly brewed coffee" at Starbucks is $1.85 as of 8/30/17. That's more than double the 5 ounces that was the customary serving in Perry's day! Let's hope they got free refills ;-) \\ OLEF641; 8/30/2017. ++ Another way of looking at it: what would it run in an expensive (French) restaurant in LA today ?? Le Comptoir has it priced at $8...la plus ca meme... Catered by Notcom, 083017. Marian Fargo is being blackmailed for $1000 ($7,350.35) a month. So far she�s been taken for $10,000 ($73,503.46). Now the blackmailer wants a lump sum payment of $10,000. Marian would be out $147,006.92 today if she paid that lump sum. Submited by billp, 1/1/2009. Perry�s $500 retainer amounts to $3,675.17. No wonder they scoot out of the bistro. Submitted by billp, 1/1/2009. In one scene on the DVD (normally cut from TV), Paul calls Perry from a phone booth while keeping a date waiting in the car! It�s one of the few times that Lothario Paul enjoys success (though perhaps temporary) with women on-screen! Submitted by Ed Zoerner, 5/10/2009. Trench coats play a prominent role. At about 15:16 on the 2006 Region 1 Paramount DVD, Marian's husband takes his coat off the coat rack by the front door inside Samuel Carlin's house. Given that Marian was due to stop by at that time, wouldn't she have recognized the coat? Or do they all look alike? Soon after, Paul joins Perry in a stakeout of the house across the street. (How many cigarettes per hour does Perry smoke? There are at least 8 butts on the ground.) Perry is partially hidden behind the bushes and wearing a dark trench coat. Professional detective Paul shows up, in a very light-colored trench coat. (Shades of Victor Laszlo in Casablanca?, where Ferrolds waiter Jean Del Val was working as a police officer.) Submitted by (lowercase, with a comma and period) masonite, 07/22/13. Speaking of conspicuous consumption, Marian's brother Charles tells Della that "while I was in prison I picked up TB" just before he takes a healthy drag on a coffin nail. In the next scene, back in his (flimsy motel?) room, after he ejects a visitor and slams the door, he starts coughing. Submitted by (lowercase, with a comma and period) masonite, 07/22/13. + He coughed at the beginning of that scene as well. In addition, he lights a second cigarette (which was just sitting on the desk) while still smoking the first one! He finally puts the first one out in the ashtray before finishing it and the second one after Daniels leaves without smoking it much at all. He could have just finished the first one and had the same amount of cigarette. Submitted by Wiseguy70005, 11/18/13. In both the novel and the episode Perry states that the unknown woman sounded "terrified" (novel) or "frightened to death" (episode). However, Angie Dickinson doesn't sound like she is in either condition. Submitted by Wiseguy70005, 11/18/13. When Marian telephones Perry at the caf�, she tells him Carlin has a file concerning a man named Charles Gallagher. She says, �Please examine it closely. Unless it is complete and authentic, you�re not to pay for it.� Perry doesn�t know the identity of the woman speaking to him, has never met Charles Gallagher, and has no idea what Gallagher may have done or what the file may contain. How is he to know whether or not the file is �complete� before handing over ten grand? And then there is the virtual certainty that Carlin would have made copies. Submitted by Dan K, 26 Sept 2018. The governor chose Not to extradite Charles. The Constitution & Articles of Confederation have EXTRADITION clauses: any person who "shall flee from justice"..."shall" on "demand of the...[governor] of the State from which he fled, be delivered..to the State having jurisdiction" [Article 4 in Both; ourdocuments.gov]." Mike Bedard 4.21.15/rev. 5.3.16. Paul had a date; as a Single person, I appreciate that Perry, Della & Paul were all Singles in the '50s when Marrieds were more typical. Mike B. 5.3.16. Continuity: Arthur Fargo's overcoat is wet when Della and Perry enter Carlin's house. (It's on a coat rack next to the front door.) However, a minute later after D&P leave the overcoat is dry. Kilo 12/12/2018. In the novel Carlin and Pierre had similar body types which made the identification easy to confuse. In the episode Pierre and Carlin don't look anything alike with Carlin several inches shorter and stockier. Submitted by Wiseguy70005, 11/18/13. + Actually, they're practically the same height; each is almost exactly the same height as Mrs. Fargo. Pierre is not quite as thickset as Carlin, but figuring out the heft of a "badly burned body" would be difficult I would think. OLEF641; 8/30/2017. ++"The Case of the Faceless Man?" Coincidentally, in the very same year that this episode aired, actors Luis Van Rooten (Carlin) and Jan Arvan (Pierre) also appeared in the B-horror movie, "Curse of the Faceless Man" (which starred Richard Anderson). One can only surmise that Arvan's "badly burned body" in this PM episode would have been "faceless" as well, given the quickness with which the authorities mistakenly concluded that the body was Van Rooten's. Submitted by BobH, 3 November 2017. Why is Carlin in the courtroom at all? Was he that curious? Submitted by Wiseguy70005, 11/18/13. +Not only is he in the courtroom, but as the final courtroom scene opens, he's seen--from a distance, of course--sitting immediately next to his accomplice. And in a not exactly impenetrable disguise: a toupee, a false moustache, and glasses. Submitted by BobH, 30 January 2016. This is the second episode in a row that a small private airplane is part of the story.